I can't explain it. For Halloween 2009, I really phoned it in and dressed as a witch. 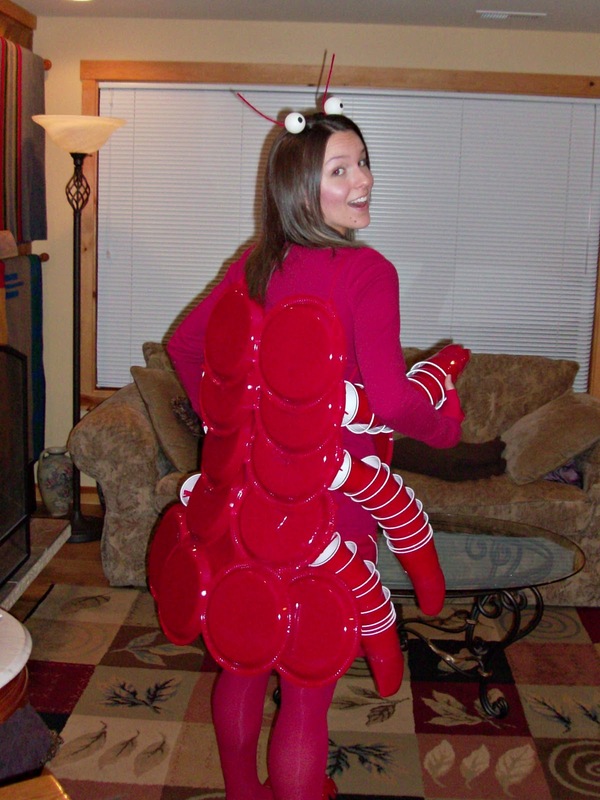 Ever since that poor showing for my favorite holiday, I knew that I wanted — no, needed — to be a lobster for Halloween 2010. And a lobster I was. A month or two ago, I was sitting in the Creative area of my place of employment, waiting for someone to set up a video camera so we could film a brief segment for the agency's new homepage video (not finished yet, but you better believe I'll link to it at some point). I don't usually have any business in Creative, so I noticed for the first time an odd, slightly creepy piece of art on the wall. It featured what appeared to be a wide-eyed marsupial. "Is that a... lemur?" I asked the creative director, who was also waiting for the shoot to begin. "Yeah," he answered casually, barely looking up from his iPhone. "Nate painted it. It's his spirit animal." The lobster, friends, is my spirit animal. The lobster costume was meant to happen. First of all, let me give credit where credit is due: to this dude. Apparently you can pay money to subscribe to this Instructables Web site and follow step-by-step directions for constructing this costume. Or, you can just study the pictures and wing it. Winging it has always been my forte. 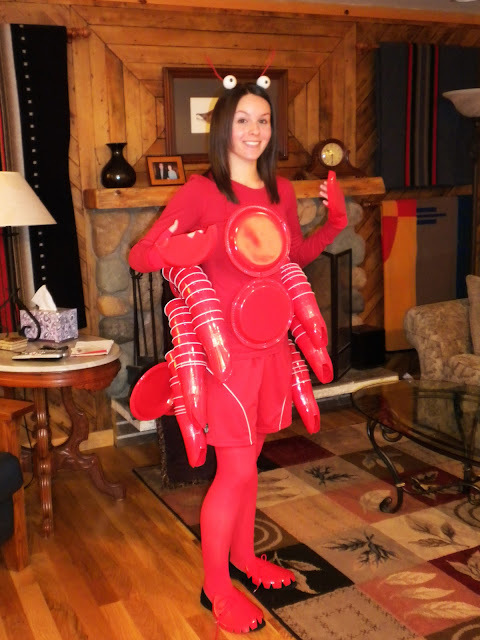 If you read the description, lobster dude says it took him eight hours to put this costume together. I didn't believe it would take that long, but it did. Oh, it did. Don gets one-thousand gold stars for putting in hours and hours of work on this with me on Saturday the 30th, immediately after we ran an exhausting 5K. All either of us wanted to do was take a nap, but he helped me string plastic cups onto red yarn to make lobster legs. He helped me cut claws out of red plates and staple them onto fingerless gloves, which allowed me to hold drinks and project ping-pong balls with the greatest of ease at the party I attended. He even came up with a way to make my feet look like lobster feet, even though I had to ditch those things early in the evening due to their instability and the very-crowded nature of the party. All the work was well worth it, as several people complimented the costume and even asked to take pictures with me at the party. It was awkward and creaky to walk in, sure, and going to the bathroom was very difficult, but it was the best Halloween costume I've ever sported and it made for a super-fun night overall. All my best friends were at the party and I had a great time. The only question is: What will I be for next Halloween? ?